Hundreds of thousands cribs are being recalled after they were connected to reports of infants becoming trapped in them, the U.S. Consumer Product Safety Commission is announcing today. The recalls are for cribs sold under the Graco and Simplicity brands. About 217,000 Graco brand drop side cribs made by LaJobi Inc. are being recalled after nearly 100 reports of hardware failure that allowed the drop side of the crib to detach. Six children reportedly fell through the resulting opening and two others became trapped, the CPSC said. Drop side cribs, once the industry standard, are on the verge of being banned. That style of crib has been blamed for well over a dozen infant and toddler deaths and is no longer being carried by the biggest children's product retailer, Toys R Us/Babies R Us. This is just one in a long string of crib recalls. The recalled wood cribs came in cherry, espresso, natural and white finishes. The name "LaJobi" and the crib's model number can be found on a sticker on the stabilizer bar or on the bottom rail of the crib. The China- and Vietnam-made cribs were sold nationwide from February 2007 through March 2010 for $140-$200. If you have one of the cribs, you are asked to stop using it until you receive a hardware kit from LaJobi that will immobilize the drop side. For more information, call LaJobi at (888) 842-2215 or visit the company's website. In a separate announcement, now-defunct Simplicity cribs are once again being recalled after the death of a child. Simplicity cribs are being targeted by the CPSC as a particular danger. A Massachusetts toddler suffocated in 2008 after getting stuck between the mattress and the frame. Another 13 incidents have been reported involving the tubular metal framed cribs bending or coming apart. The cribs were sold under the Aspen, Chelsea, Graco and Simplicity brands. 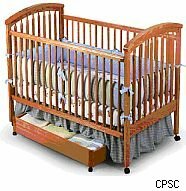 The CPSC is urging anyone with one of these cribs to stop using them and find another place for their infant or toddler to sleep. The safety agency said it does not know how many of these metal-framed cribs were sold. The China-made cribs were sold at chain stores nationwide including Walmart and Target for $150-$300. Consumers can return these cribs to the store where they were purchased for a refund, credit or replacement crib.